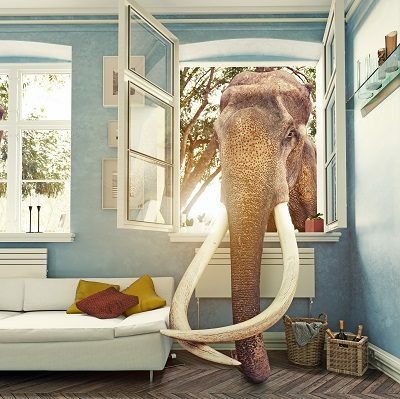 Stuffing an Elephant Through the Window? Because in the labeling world, nothing’s standard. Yet so many companies try to sell you something right off the shelf. These days, packaging comes in all shapes and sizes – curved sides, flexible surfaces, multi-faceted geometry. There’s often a hiccup. Without a labeling manufacturer with strong engineering talent, you find yourself too often forcing a round peg into a square hole. 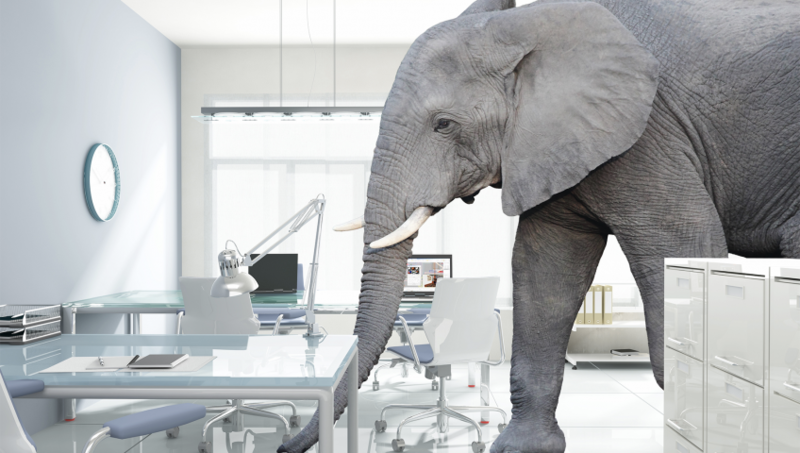 You’ll have better luck stuffing that elephant through your living room window. The good news? 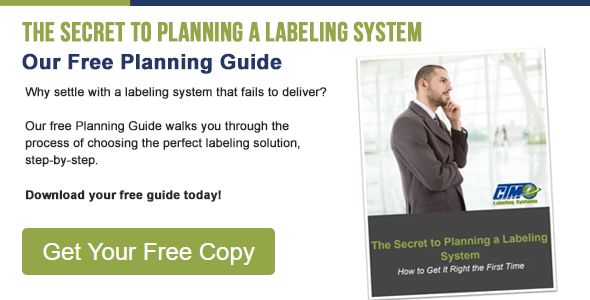 If you know what to look for, you can spot unsuitable labeling providers a mile away. Their elephant can return to the zoo and live happily ever after. For starters, the company needs to feature a robust engineering department. Many people incorrectly assume sticking a label on a product is a piece of cake, like slapping a rock & roll sticker on an electric guitar. That’s understandable. When it works, a labeling machine makes the entire labeling process seamless. You barely have to lift a finger. But there’s actually a lot of custom engineering happening beneath the surface. In reality, the labeling portion of a production line is just as complex and important as any other part of the manufacturing process. For one, significant marketing dollars are invested in the branding of that label. If it doesn’t look absolutely beautiful, consumers will judge your product; sales suffer. Then there are traceability issues, including legal liabilities for medical equipment and food supplies, or stiff fines for missed or improper labeling from big-box retailers. Profit margins are at stake in labeling your products beautifully and perfectly, every time. What’s the best way to tell if a labeling equipment manufacturer is up for the job? Take the 25 cent tour of their facility. Are they just an assembly house or do they do legitimate engineering and customized builds? What are their factory capabilities, inventory levels, machining capabilities, or engineering staffing like for customized applications? On the floor of the machine shop, you can see the difference clearly in the sweat, grease, and #2 pencils sharpened down to the stubs. Did you know that 83.5% of statistics are made up on the spot? The same can often be said for “labeling solutions.” Some labeling manufacturers are more salesmen than problem solvers. They’ll pretend they can do just about anything just to get that check signed. The best manufacturers are the ones who tell you they can’t do it and then explain why. Show those bullet points to the seller who claims they can. Nine times out of 10, they’ll look at you like a deer in headlights or maybe a rifle scope. 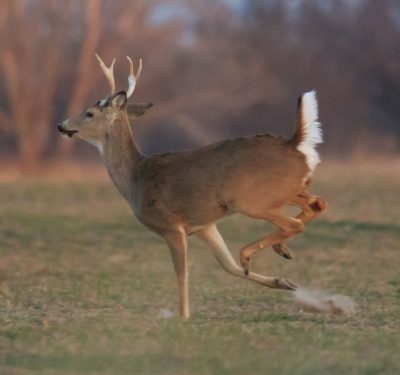 Say “Cheese,” and watch their little white tails scissor-leap into the sunset. You can buy a Ford Bronco for $30,000 or you could find one for $700. Which one would you drive to Alaska and back? When it comes to labeling machines, like much in life, you get what you pay for. Plenty of labeling manufacturers will try to lowball the price. Ninety percent of the time, either the solution won’t work or there’ll be a pandora’s credit card bill of costs they “forgot” to tell you about. What do they care? Once they’ve got your business, your check is cashed and they’re onto the next sale. With only half a solution, you’re stuck trying to improvise a fix right on the manufacturing floor, or even worse, having to return the system, if the labeling equipment provider is even willing to take it back. And in the meantime? You’re stuck with wasted investment, a machine that doesn’t run, and a production run dog-dead in its tracks. What’s the most “beautiful” labeling machine in the universe without the backup and training to keep it rolling? A hundred-pound anchor of bulky dead weight. Your team won’t use it. They won’t hang pictures of their kids on it. You’re stuck with a taboo piece of expensive equipment nobody understands how to make work. The best label systems manufacturers are committed. Ideally, the relationship is more partnership than purely transactional, more symbiotic than break-it-you-buy-it. They offer support, training, and repair assistance on the equipment long after the sale is finalized. Your success is theirs. You are in this together. How do you know a labeling machine works like it’s supposed to? You actually sleep at night, soundly, on a billowy pillow of worry-free dreams. In fact, you might just forget about labeling altogether. The machine runs continually, effortlessly, superbly. Labeling ceases appearing as a throughput lag in your data tracking. It becomes just another equal sign in the equation of production – smooth, seamless, absolutely perfect.